Four large bins containing the archival material of artist Ed Ruscha arrived at the Ransom Center recently. 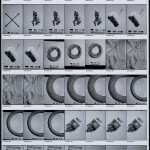 Packed and carefully layered within were boxes, tubes, and portfolios containing Ruscha’s notable creations on paper. The collection includes his limited edition artist’s books and deluxe suites of prints, photographic publications, colorful exhibition posters, prints of his 16 mm movies, and a rich assortment of papers and journals documenting the creation of his publications and art commissions and referencing his various literary influences. Together, this material represents the achievements of a remarkable artistic career that spans more than half a century. 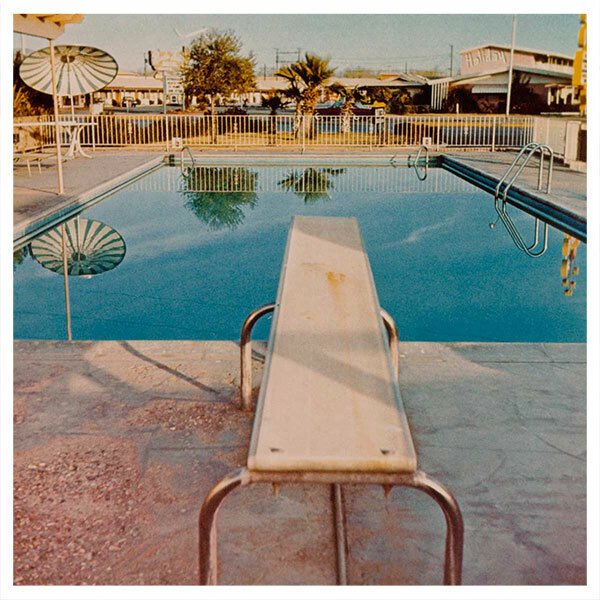 Born in 1937, Ed Ruscha is considered today to be one of the most important artists of his generation. Words and wry phrases have always played a central role in his artwork, beginning with the West Coast Pop Art phenomena of the 1960s where his roots run deep. For Ruscha, whose background includes commercial art and typesetting, words are visually malleable and can carry multiple meanings. “I like the idea of a word becoming a picture, almost leaving its body, then coming back and becoming a word again,” Ruscha once said. 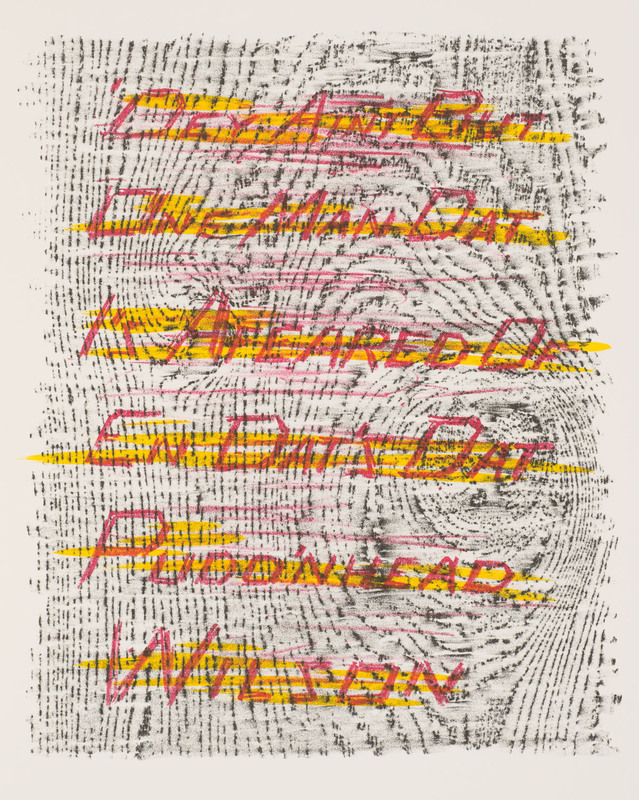 Single word paintings with odd titles such as Oof (1963) and Boss (1964) were early precursors to more complex works such as the series of rhyming prints titled News, Mews, Pews, Brews, Stews & Dues (1970), which are included in the archive. Ruscha’s art would evolve and expand intellectually—Marcel Duchamp and Jasper Johns were early influences—to become beautifully crafted and complex conceptual works of art, which have been described over the years as being comedic, deadpan, and elegantly laconic. West Coast car culture and commutes on Route 66 between Los Angeles and Oklahoma where Ruscha grew up all helped inspire many of his photography-based artist’s books such as Twentysix Gasoline Stations (1962), Royal Road Test (1980), and Parking Lots (1999). All are represented in the archive. Most recently published is On the Road (2010), Ruscha’s limited edition artist book of the classic novel by Jack Kerouac (1922–1969). The archive includes full-size mockups of the book, annotated copies of the novel, sketches, photographs, correspondence, and business papers. 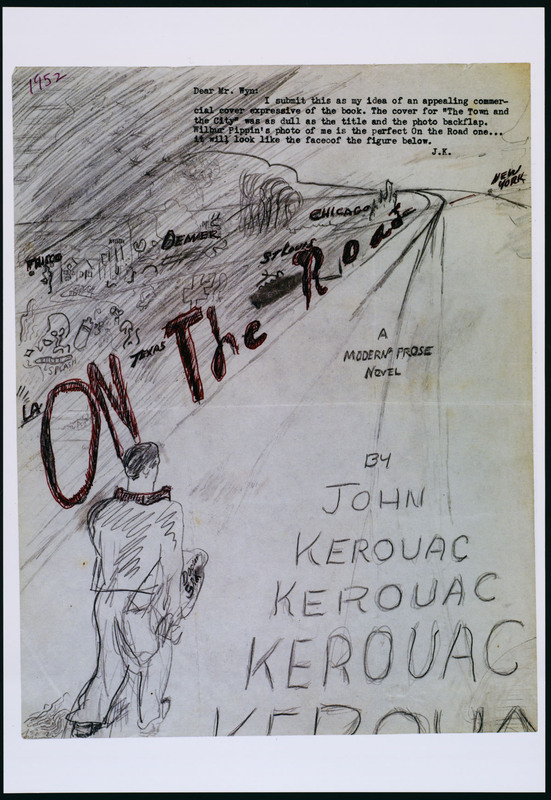 These materials resonate perfectly with the Ransom Center’s own collection of materials related to Beat Generation authors, which includes the journal that Kerouac kept while preparing to write On the Road. 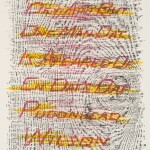 Also included in the archive is Sayings (1995), a folio of ten color lithographs bound in linen that are based on Mark Twain’s novel Pudd’nhead Wilson: A Tale (1894). 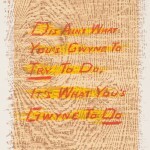 Ruscha selected phrases written by Twain in a black dialect spoken during the era of slavery. 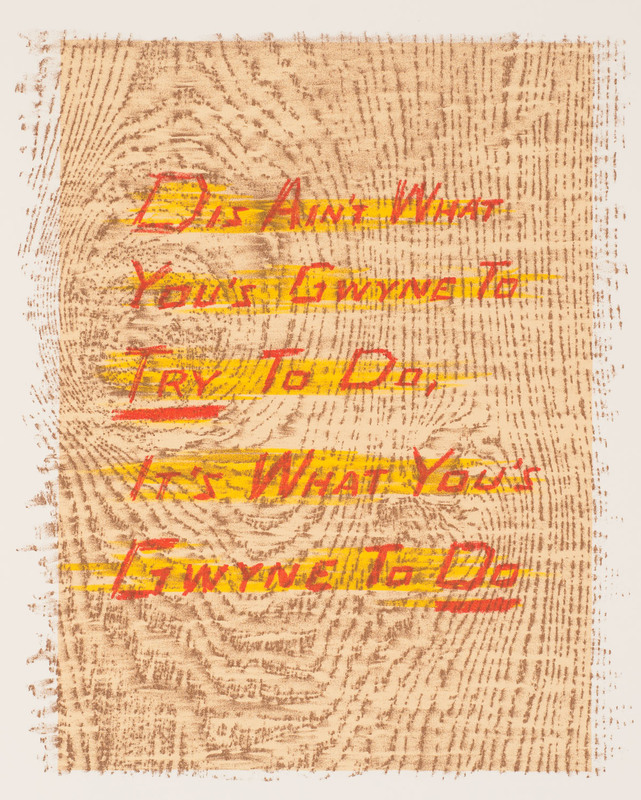 He superimposed the phrases (hand-written in what Ruscha calls his “Boy Scout Utility san serif”) over colorful wood grain patterns, creating a tension that resonates with larger social and racial issues in America today. 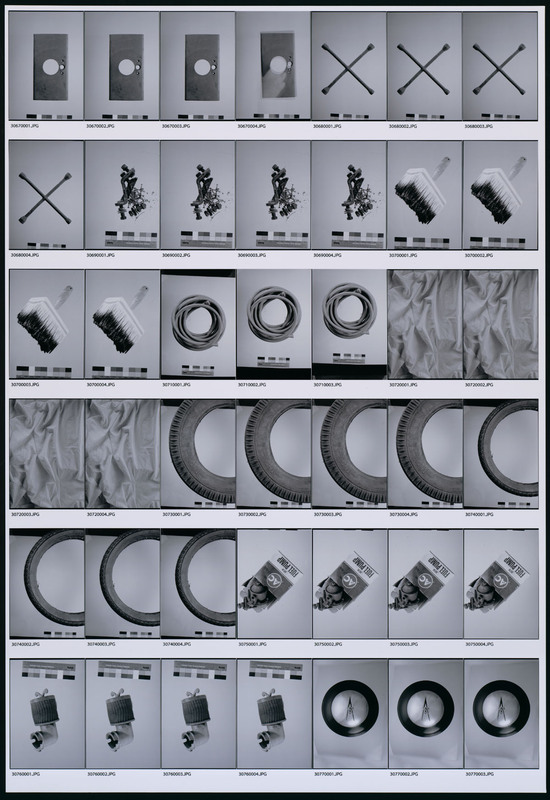 Ruscha’s creative distillation of popular American culture over the last half century with its layers of typographical code makes him an exciting artist to explore, and, for the Ransom Center, one of the more compelling if not quintessential to acquire. 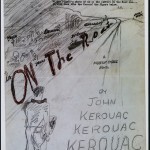 Art concept related to Ed Ruscha’s artist book edition of Jack Kerouac’s novel “On the Road.” The edition was published in 2010.